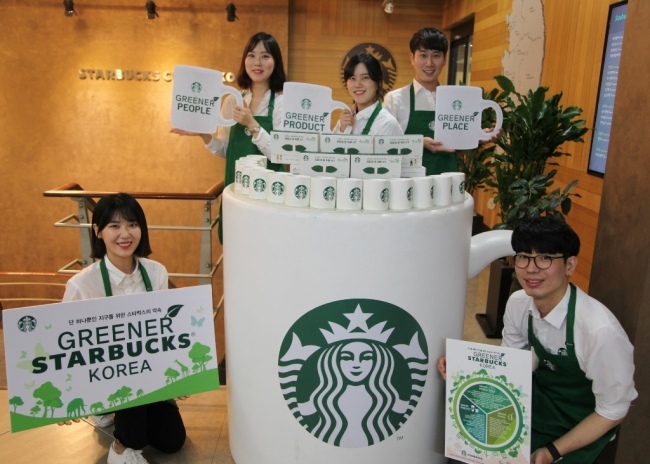 Acting in tandem with the global coffee giant’s headquarters, Starbucks Korea announced Tuesday that it will kick off the “Greener Starbucks” campaign to go plastic-free at all of its stores nationwide. According to the company, it will gradually introduce paper straws at all of its 1,180 stores across the country. It will also adopt specially designed paper cup lids for cold drinks so customers do not need to use straws. The company said at least 180 million 21-centimeter-long plastic straws are used at its stores in Korea annually. Through the environmentally friendly campaign, the company expects some 126 tons of plastic will be reduced annually at its stores here. In addition, plastic coffee stirrers and wrapping vinyl for packing merchandise will be substituted with biodegradable materials. To boost consumers’ participation, Starbucks Korea said it would upgrade membership benefits, such as giving a 300 won (27 cent) discount to those who bring personal mugs or tumblers to the store. The company will also actively educate its baristas to suggest eco-friendly options to customers in order to effectively carry out the zero-plastic campaign. “For our future generation, an introduction of eco-friendly business operation is not an option, but mandatory for all companies. 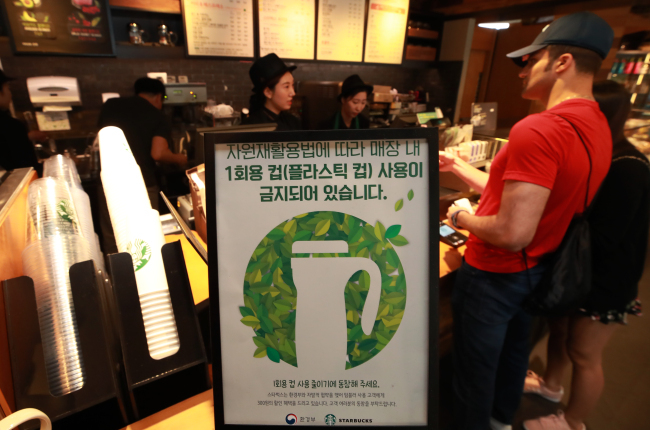 Starbucks Korea will continue to take the lead in bringing about a positive change to the environment we live in,” said Lee Seock-koo, Starbucks Korea CEO. The decision followed the announcement made by Starbucks on Monday that it would eliminate all plastic straws from its 28,000 stores by 2020 in a move to combat pollution from disposable plastic. The firm announced the news on Twitter after months of tests, with many of them carried out in Britain. Plastic straws will be replaced by recyclable lids that have a small raised opening that allow consumers to sip their drinks -- a model that has already been tested with some of the company’s cold beverages in the US and Canada. Plastic straws have proven difficult to recycle, not because of the material they are made from, but because they are too slim for recycling production lines to effectively sort. The new lids, made of polypropylene, will be big enough for machines to recycle, Starbucks said. The store will automatically offer cold drinks with the new lids, but for Frappuccinos, the store will offer paper straws or those made of compostable plastic based on fermented plant starch. Customers who prefer a straw with their drink can ask for one. By not automatically offering straws with drinks, Starbucks estimates it will save a billion straws a year. Advocacy groups, including Ocean Conservancy, welcomed the move. Several European countries and cities in the United States are mulling restrictions on the use of plastic straws, although outright bans are still rare. In the US, Seattle -- the hometown of Starbucks -- is the only major city to have so far banned the use of plastic straws at eateries. Pressure from consumers is driving many companies to tackle waste from packaging. McDonald’s is testing the use of biodegradable straws for its drinks.